At 65, Lou Hays has earned the right to finally take it easy. Instead, he works 40 hours a week in an environment that can be both physically and emotionally draining — and takes home no paycheck. Hays is a volunteer for the Humane Society of Cherokee County (HSCC) in Oklahoma, a community about 70 miles from Tulsa. When he and his wife — and two dogs — moved there 14 years ago from Dallas, no official animal shelter existed. A year later however, his house was home to nine dogs, and Hays was part of the team working to establish a local rescue facility. By 2004, their goal was realized, and the group broke ground on a piece of land in Tahlequah, OK. The shelter, which has never received government funding of any kind, had its work cut out for it. Fortunately, Hays was just getting started. There were grant applications to write, medications to administer, hoarding case victims needing extra care and comfort. Hays proved proficient — and passionately dedicated — in each arena. By all accounts, Cherokee County is not a wealthy area. It is a constant effort, according to Hays, to find space — even temporary — for the strays, surrendered, and lost animals that find their way to the shelter. Until HSCC came along to establish a spay/neuter campaign, the numbers of homeless dogs and cats grew at staggering rates. Overpopulation is still a big issue. Hays had an idea: transfer the many deserving companion animals in the county to nearby regions that could accommodate the surplus. In 2007, he reached out to low-volume shelters in Colorado and Illinois, offering to bring them healthy but needy dogs and puppies. They agreed, and Hays has been single-handedly coordinating the program — and driving animals to their new beginning — regularly ever since. It’s no easy task, but the long hauls are the least of the challenge. The paperwork and logistics are much more complicated than the driving, Hays says. Still, he ensures the opportunity for adoption for 30 to 35 dogs each month. He transports them himself to the receiving shelters — some, hundreds of miles away. It’s what he does; it’s who he is. 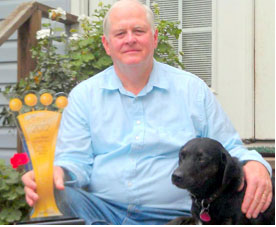 In October, DogTime Media named Lou Hays its Unsung Hero of the year as part of its Petties celebration. Well over 1,300 nominations were submitted from around the country, but Hays was chosen to receive the honor, which includes a $10,000 donation to the shelter of his choice. Naturally, he picked HSCC as the beneficiary. True to his heroic spirit, Hays accepted his award with humility and genuine surprise. “I was returning from a dog transport to Chicago when I got the news, and I nearly ran my transport van off the road!” he told us. Here at DogTime, we had the privilege of communicating with Hays frequently in the days following the announcement of his selection as Unsung Hero. In each phone call and in every email, Hays was effusive. Thank you, he said, more times than could be counted. No, Lou Hays, thank you. Lou Hays, winner of the Unsung Hero award.